So chic! I love that jacket and your top too! Those booties are so fun! The red color makes a fantastic accent to the black. That coat is beautiful! So gorgeous! I love the touches of red! I am obsessed with those boots! I can't believe I still don't own a pair of red boots! The pop from those red boots are everything, but i love your hat! amaaazing coat and pictures, as usual!! love the pops of color with the red! Am loving those boots, such a great contrast against the snow, love it!! Those red boots are just perfect and the contrast against the snow is just gorgeous! Flawless look :) So chic! Love, love, love your all black look with the pop of color of the gloves and boots! Very chic. Loving the top! Hope you're staying warm up there! I love this look, so stylish and the hat compliments it perfectly :) I love your blog and I have followed you with Bloglovin. If you ever get a chance to check out my blog I would be delighted, thanks! So stylish and chic! Loving the coat and the hat! You can check out my new outfit post! Beautiful look! Love this long coat! WOW your hat and coat is soooo beauiful!!!!! I love your boots! Such a fun addition to your outfit! Beautiful outfit! You have an amazing, chic style!! Stunning look! 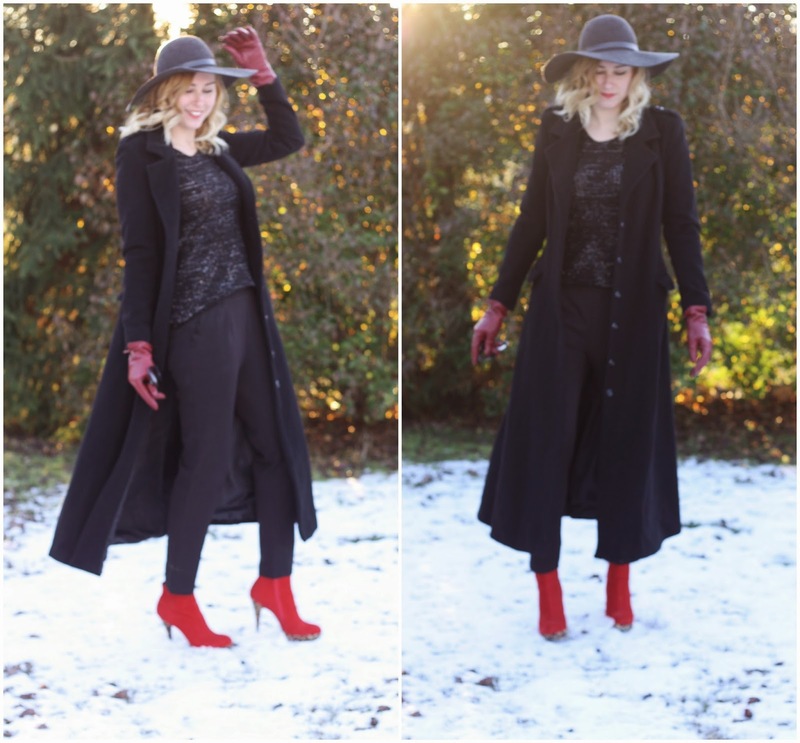 Love the long coat and those red booties! Gorgeous outfit! I love the pop of red with the gloves and the boots!